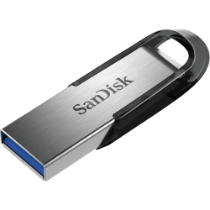 The SanDisk Ultra Flair™ USB 3.0 flash drive moves your files fast. Spend less time waiting to transfer files and enjoy high-speed USB 3.0 performance of up to 150MB/s(1). Its durable and sleek metal casing is tough enough to handle knocks with style. And, with password protection, you can rest assured that your private files stay private(2). Store your files in style with the SanDisk Ultra Flair USB 3.0 flash drive. Experience high-speed USB 3.0 performance of up to 150MB/s(1) with the SanDisk Ultra Flair USB 3.0 flash drive. Transfer files faster than standard USB 2.0 drives. (1) (for 32GB, 64GB & 128GB) Write to drive up to 15x faster than standard USB 2.0 drives (4MB/s); up to 150MB/s read speed. USB 3.0 port required. Based on internal testing; performance may be lower depending on host device. 1MB=1,000,000 bytes. (for 16GB) Read speed up to 130MB/s; write speeds lower, vary by capacity. USB 3.0 port required. Based on internal testing; performance may be lower depending on host device. 1MB=1,000,000 bytes. Combined disclosure for materials that feature all capacities: 32GB, 64GB, 128GB: Write to drive up to 15x faster than standard USB 2.0 drives (4MB/s); read speeds up to 150MB/s. 16GB: Read speeds up to 130MB/s; write speeds lower and vary by capacity. USB 3.0 port required. Based on internal testing; performance may be lower depending on host device. 1MB=1,000,000 bytes. (2) Password protection uses 128-bit AES encryption and is supported by Windows Vista®, Windows® 7, Windows 8, Windows 10, and Mac OS X 10.6+ (Software download required for Mac, see www.SanDisk.com/SecureAccess) CHINA ONLY: Password protection is supported by Windows Vista®, Windows® 7, Windows 8, Windows 10, and Mac OS X 10.6+ (Software download required for Mac, see www.SanDisk.com/SecureAccess) (3) See www.sandisk.com/wug (4) 1GB=1,000,000,000 bytes. Actual user storage less.